“Assess Don’t Assume,” is a great phrase that I heard a long time ago form one of the coaches that I look up to the most, Eric Cressey. He and Mike Reinold were doing an assessment of an overhead athlete and they were talking about assessing athletes before making assumptions based on how they move or function. This is something that we still to this day at CBC live by. This year in our elite summer program we had a hitter who we were trying to get to drive the ball in the air with a little greater loft. This particular athlete had the ability to drive the ball all over the field at velocities that far exceed 90 MPH. The one thing that was suffering in spite of his great velocity was his distance. Upon assessing the athlete even at velocities over 90 MPH he wasn’t hitting balls over 330 feet all that consistently. The biggest part of his game that we wanted to affect was his exit velocity, we wanted him to leave our summer program regularly hitting balls over 100 MPH. Secondly we would like to see him drive the ball in the air a little more with his increase in exit velocity. Before making any swing changes we assessed him and noticed that he had trouble externally rotating his back arm (left) and we also noticed that he had poor thoracic spine rotation. Based on these findings it became apparent that his swing path was so steep because he was unable to lay back this let arm to let the barrel lay into the zone. Instead he was pushing the bat through the zone in front of his body which made his path extremely steep and to the right. 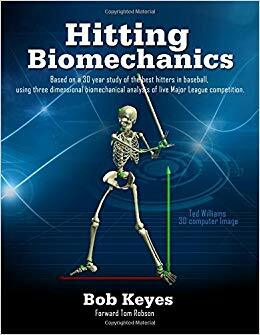 This led me to believe that this was the reason for his consistent negative attack angle on our Blast Baseball sensor. Due to his consistent negative attack angle (swinging down) this in part led to his launch angle (angle of ball coming off the bat on a vertical axis) being very low. Anything that was hit any higher than the back of the cage 14’ high was actually an oblique collision. Due to his attack angle being negative and the ball coming off of the bat in a positive (upwards) direction this was creating minimal exchange in power between the bat and the ball. This is similar to a car hitting the back tail light at 40 MPH and causing the car to spin out as compared to hitting the car head on at 30 MPH. Even though the second collision is lesser in speed it certainly makes up for it in energy transfer from one object to the other due to the solidness of impact. Based on his assessment we went to work on fixing his restrictions in thoracic spine mobility and lack of external rotation in his back arm. This was achieved through exercises and warm ups that activated the area that we wanted to affect. Throughout the entirety of this program the athlete conducted the warm up and mobility exercises prior to stepping in the cage and hitting. These movement prep exercises helped to prime the athlete for what we wanted to have happen. These exercises included: Quadruped thoracic spine rotations, bench thoracic spine mobilizations, supine elbow elevated external rotation holds, and band assisted Duffin rows. These exercises were the first phase of the program (4 weeks). Based on his progress we adjusted the second phase (4 weeks) of his program and prescribed exercises accordingly. After the 9 weeks that the hitter was here we saw his exit velocity go from 91.8 to 103.0. But perhaps the biggest factor that benefited from these drills was his distance. He ended the summer routinely hitting balls over 390’ and maxed out at 405’. The best part about this was that we actually didn’t make very many swing changes throughout the summer. Instead we freed his body up to work in a fashion that allowed for greater distances. By his back arm being better able to lay back and slot the bat into the zone he was able to take his attack angle from an average of -2.8 to +9.9 which allowed him to transfer more energy from the bat into the ball upon collision which increased his exit velocity and distance. As a side note, ultimately we would like to see the attack angle and launch angle be within 10 degrees of one another. With the two numbers being closer together rather than farther apart it allows for a greater redirection of energy from the barrel into the ball. When we see the two numbers being greater than 10 degrees apart we often do not see velocities that are within the max for the individual. This is what is referred to as an oblique collision, as coined by Alan M. Nathan. This was one of the best transformations that I have been a part of due to it being a more organic swing change. The instruction didn’t necessarily come from me, we just allowed his body to get into a better position to carry out the goal which was to drive the ball with greater velocity in the air.